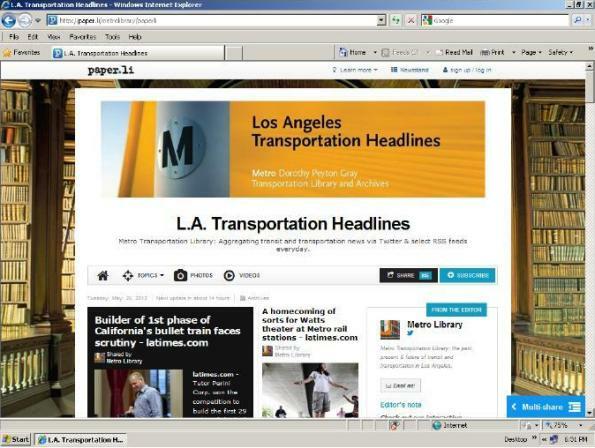 The Metro Transportation Library is preparing to move the daily transortation headlines from Blogger to Paper.li. Please see the post to learn more about the new format and receiving it through RSS / Feedburner or email. The concussion rate from bike accidents in recent years has grown faster than the sport of cycling. Why? This long and excellent magazine article by Bruce Barcott seeks the answer and comes up with some interesting conclusions. Most troubling, to me, is that federal government standards for bike helmets have not changed since 1999 despite considerable research into brain injury prevention since then. Nonetheless, some companies are making progress at creating helmets that can both prevent catastrophic injury and more routine concussions. If you’re interested in cycling, please read. The outgoing U.S. Secretary of Transportation hints that perhaps the President may have an idea to replace the federal gas tax which funds many projects but has been struggling to keep pace with demand (the tax hasn’t been raised in 20 years and is also taking a hit because cars are more fuel efficient these days). Replace the gas tax with what? Governing speculates that maybe it’s a tax based on how many miles people drive, a solution backed by many transportation experts. A bill that would allow single occupant vehicles to use carpool lanes on parts of the 134 and 210 freeways during non-rush hours sailed through the Assembly last Thursday. Yes, I know that was almost a week ago — but overlooked this one last week and it’s certainly newsworthy. Seems like the next big regional conversation we’ll be having in future years is over management of the HOV lanes. Should they be carpool lanes all the time? Some of the time? Or congestion pricing lanes sometimes or all times? HOV lanes in the Bay Area revert to general use lanes during off peak hours, right? And they don’t use the double-yellow stripe to separate them out. If it works there it could work here. Seems like they are starting to program the TVM at the El Monte Station. Should be carpool/HOV lanes for at least more than one rider at all times. The incentive to transport efficiently with more than one person by private automobile should be at all times, not just rush hour. Opening up HOV to single occupant vehicles would seem to work against that. Carpool lanes are just that! Two or more at any given time 24/7/365. Exception would be HOV exempt vehicles per State laws governing HOV lanes. PLEASE stop referring to bicycling as a “sport”.